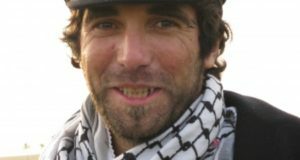 LONDON, June 23 — Three years ago, in an incident that resonates now with the recent killing of seven members of a Palestinian family on a Gaza beach, a documentary filmmaker was shot to death in Gaza. Then as now, the victims’ families blamed the Israeli military, which denied responsibility. A major difference is that the filmmaker, James Miller, was a British citizen, and after some prodding from his family, his government has taken up his cause. At first, about the only thing not in dispute in the Miller case was that he was dead, shot on May 2, 2003, in an area of the Gaza Strip thick with Israeli soldiers. The Israelis said he was a casualty of war. His colleagues said he had been killed in cold blood. His family fought to know more. A resolution of sorts came in April at a coroner’s inquest here into the death of Mr. Miller, 34, an experienced filmmaker looking into the effects of violence on children for HBO. The jury’s verdict was that he was murdered. The killer was identified as the commander of an armored personnel carrier in the Israeli Army who had admitted firing his gun that night, but no one in Israel has been charged, and many of the questions raised in the hours after the shooting have never been resolved. Suspecting that answers might not be forthcoming, the Miller family sent a private investigator to the scene the day after the killing to do forensic tests — tests, the investigator said, that the Israelis never conducted. In the next few days the army bulldozed the site, destroying much of the remaining evidence, the investigator said. The Israeli military’s criminal investigation, including the basic task of confiscating and securing the soldiers’ weapons for tests, did not begin until several weeks after the fact. Lt. Col. Jana Modzgvrishvily, the military advocate for the Israeli Army’s southern command, said in an interview that after Mr. Miller’s death, the army immediately began a standard field investigation, followed by a full military criminal investigation. She said nine soldiers in the two armored personnel carriers near the scene were repeatedly interviewed and subjected to lie detector tests. She confirmed that the weapons had not been secured for three weeks but said they had been subjected to extensive forensic tests. It is not just the Miller family who denies that the Israeli inquiry was thorough and comprehensive. So, too, does the coroner at the London inquest, who urged the British government to begin an international prosecution against the commander of the personnel carrier under the Geneva Conventions. So does the British government itself. The attorney general, Lord Goldsmith, raised the case last month with Israeli officials, including the defense and justice ministers. He also brought up another case, that of Tom Hurndall, 22, a British antiwar protester who was shot and killed by an Israeli soldier in February 2003, three weeks before and a mile away from where Mr. Miller died. In Mr. Hurndall’s case, the soldier, Sgt. Taysir Hayb, is serving an eight-year sentence for manslaughter. Lord Goldsmith said he needed “to consider myself whether there ought to be prosecutions here in either of these cases.” He said he did not want to raise expectations but was keeping an open mind. Speaking of the Miller case, a spokesman for the British Foreign Office, asking that his name not be used in accordance with government policy, said: “We have pressed the Israelis at every level, and at every stage, to agree to a full and transparent investigation. We are disappointed that the investigation wasn’t carried out properly and hasn’t resulted in an indictment, and that the I.D.F. has decided not to discipline the person alleged to have shot James Miller.” The initials stand for the Israeli military’s official name, the Israeli Defense Forces. Accounts of what happened diverged almost from the moment Mr. Miller was shot. It was late at night in the ruined town of Rafah, at the southern end of the Gaza Strip, and Mr. Miller was concluding his third visit for the film. He specialized in documentaries about the downtrodden and the oppressed; his past work included “Beneath the Veil” (2001), about the war in Afghanistan, which won Emmy and Peabody awards; “Children of the Secret State” (2000), about famine in North Korea; and “Armenia: The Betrayed” (2002), about the massacres of Armenians in 1915. Mr. Miller and his colleagues had spent the evening at a Palestinian house, filming Israeli bulldozers knocking down Palestinian buildings. Two Israeli armored personnel carriers were in the area, investigating reports that a Palestinian tunnel under the Egyptian border was being used to smuggle weapons into Gaza. The vehicles were fired on during the day, and the soldiers responded in kind. By 11 p.m. or so, things were quiet. The filmmakers decided to call it a night. Wearing flak jackets and hats marked “TV,” waving a white cloth in the air that they illuminated with a flashlight and shouting that they were British journalists seeking to leave the area safely, Mr. Miller and two colleagues, Saira Shah and Abdul Rahman Abdullah, slowly walked toward one of the armored personnel carriers. But suddenly, according to Ms. Shah and Mr. Abdallah, a shot rang out close by. A warning, they said they thought. They dropped to the ground. Thirteen seconds passed. Then there was a second shot. It hit Mr. Miller. He lost consciousness almost immediately and was pronounced dead at an Israeli base. His wife, Sophy, at home with their children, then 3 and 1, and expecting her husband the next day, woke up to a phone call from a distraught Ms. Shah. Soon it was all over the news. But while Mr. Miller’s colleagues said he had been shot in the front of the neck from the direction of one of the Israeli vehicles, the Israelis initially gave a different account. Mr. Miller walked into an exchange of gunfire, they said, and was hit in the back by a Palestinian bullet. 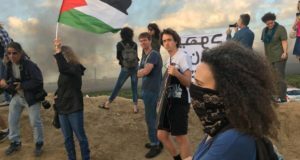 The next day, the Miller family dispatched Chris Cobb-Smith, a security expert and British Army veteran, to Gaza to investigate. “The emphasis had to be on us to do the proper investigations, because it was obvious that the I.D.F. was not going to conduct their investigation with any impartiality,” said Mr. Cobb-Smith, whose examination of footprints, tank tracks and traces of blood and bullet holes, among other things, led him to conclude that the shot that had killed Mr. Miller had come from an Israeli vehicle. He said no one from the Israeli Army had interviewed him about his findings. One of the most important pieces of evidence was a grainy video taken by an Associated Press Television News cameraman from the balcony of the building that Mr. Miller had just left. Seven intermittent shots can be clearly heard on the audio, 13 seconds apart, then 12, then 5, then 15, then 5, then 12. Interviewed at home in rural Braunton, Devon, Mrs. Miller said her husband had worked in hostile environments for 14 years and was known for his extreme caution. She says she has fought so hard not just for her husband, but because she is disturbed at what she sees as the lack of accountability in the Israeli Army in this and other cases. The Israelis now agree that Mr. Miller was indeed shot in the neck, from the front. But they say there is no evidence that M-16 bullet fragments recovered from his body match the guns of any Israeli soldiers in the area. And after analyzing the audiotape of the gunfire, an Israeli expert concluded that the first two shots had come from “an urban area” — from the direction of populated Rafah — rather than the Israeli vehicles. Mr. Miller was killed by the second shot. Freddy Mead, a British ballistics expert sent by the family, likewise could not link the bullet that killed Mr. Miller to any particular weapon. But Mr. Cobb-Smith said that conclusion was meaningless because of the delay in seizing the soldiers’ weapons and the lack of a credible chain of evidence in the investigation. The army’s 94-page report shows that the investigation focused almost immediately on the commander of one of the Israeli personnel carriers, the only one who fired his weapon around the time Mr. Miller died. But although the commander, identified in the report as First Lt. H., gave conflicting accounts in six separate interviews of when and why he had fired, he was adamant — as was every other soldier — that they could neither see nor hear the Britons approaching. Mr. Miller’s colleagues disputed that, saying the soldiers knew they had been filming from the balcony and had taunted them from their vehicles. The evening was clear, they said; the soldiers had night-vision equipment. The military’s judge advocate general recommended that the commander, who has since been identified by the Miller family as First Lt. Hib al-Heib, be disciplined for improperly using his weapon. But the recommendation was rejected. The London inquest, held as is the custom in Britain when a citizen dies in violent circumstances abroad, took place this spring. The coroner, Dr. Andrew Reid, criticized Israel for not participating and joined Mr. Miller’s family in calling for the British government to consider an international prosecution of the Israeli soldier. The Millers have filed a civil suit in Israel. 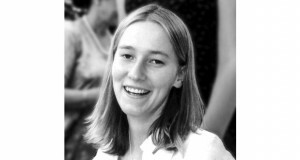 Anne Waddington, Mr. Miller’s older sister, said that while the jury’s conclusion was reassuring, it was not enough. After Mr. Miller died, his colleagues finished the film, with an ending he had never envisioned: his own killing. Its title was “Death in Gaza,” and it won a host of awards, including three Emmys.